I was driving down Superior Avenue near my library the other day, when I saw something unexpected out of the corner of my eye. 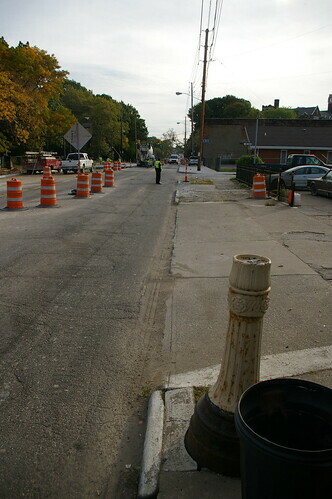 Look in the lower right corner of this photo, on the south side of Superior, between East 90th and East 91st Streets. On closer inspection, I saw that it was the cast iron base of a street light, from the 1910s or 1920s. Can anyone identify the flower design? Photo by The Heiser Co., Commercial Photographers, Cleveland. 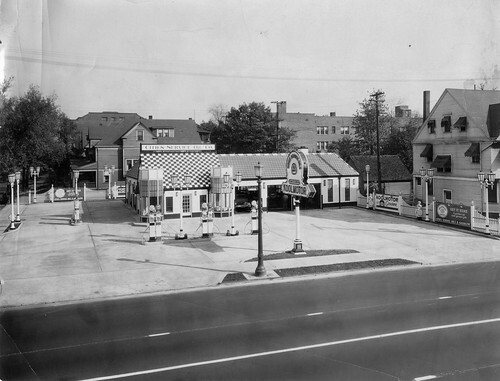 Remember this service station, at 8201 Carnegie Avenue? I wrote about it back in April, comparing it to the site as it is today. On the edge of the street, in the center of the photo, you can see another streetlight. 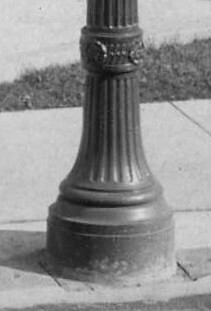 Here's a detail of the streetlight on Carnegie and a close-up of the base. Compare it with the one I stubled across on Superior. Note that while they're similar, they're not identical. How this lightpost survived so long is anyone's guess. It was replaced by a light on a wood pole long ago. It's an interesting little fragment of our area's history, and I'm glad that it's still here. In coming weeks, look for other historic fragments on these pages. A great find--an elegant bit of old Cleveland in an area which looks kind of desolate. The flower on the base is a stylized rose, and the leaves above are acanthus.